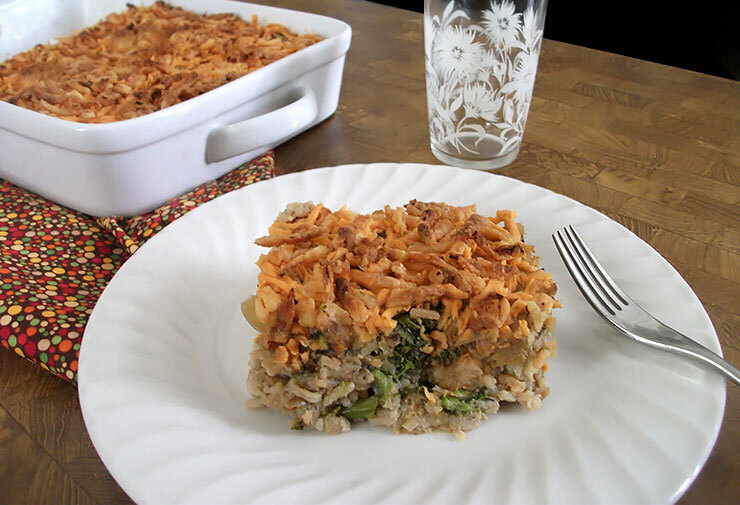 Aside from the fact that it's vegan, there's one main difference between our casserole and your mom's. Most likely your mom's casserole had canned soup (and possibly canned or frozen veggies as well). Not ours. Our casserole is going to be made from scratch, and that's what makes it an adventure. First, you need to make some seitan. Click here for full instructions and step-by-step photos on making seitan. Cut the seitan into small cubes. You also want to cook up some of your favorite rice. Follow the instructions on the package, but where the directions call for water, use vegetable broth instead for some added flavor. Now it's time to make that soup. 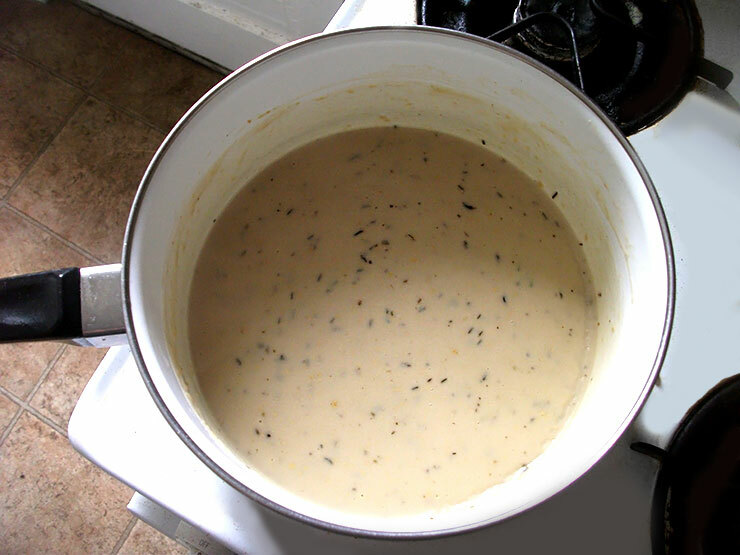 Since it's a creamy soup, we're starting with a roux. 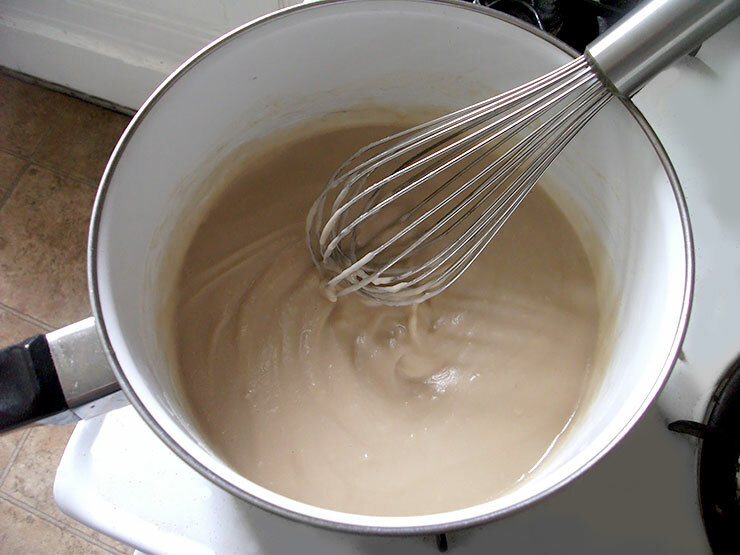 Despite what you may have heard, a roux is pretty easy to put together. You just need to melt some margarine, then whisk in some flour until it takes on a sandy color and a lightly toasted fragrance. 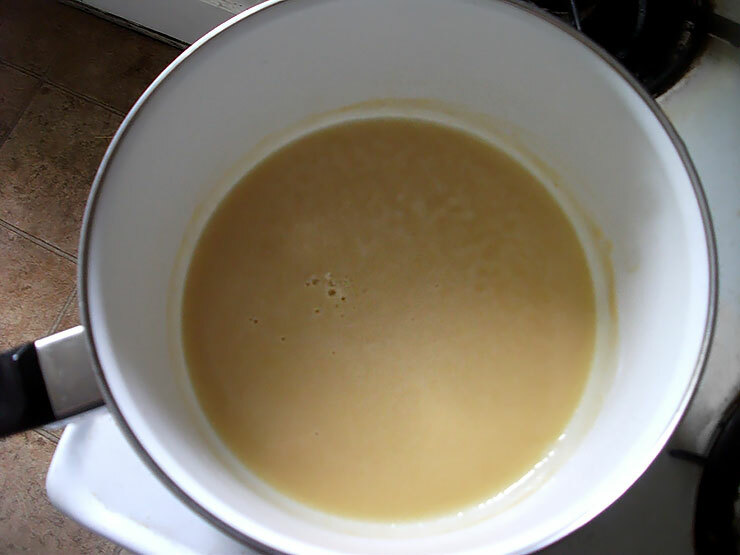 After making the roux, slooowly pour in some mushroom or vegetable broth while continuing to whisk. I like to use mushroom broth so it tastes like cream of mushroom soup. The consistency should be smooth and thick. Finally, whisk in some soy milk and seasonings. Simmer it for a little while so that it thickens up, keeping in mind that it will continue to thicken as it cools. Set the soup aside while you get to work on the veggies. Fry up some onions, mushrooms and broccoli in a little olive oil. That's all you need to do! Now grab a great big bowl and mix everything all up together...your seitan, your rice, your creamy soup and your veggies. Spread it all in a casserole dish and, if you want, sprinkle some Daiya on top. Cover everything with your favorite crunchy topping. I like crispy onions. Bake the casserole until it's melty and brown on top, and then you're ready to take your tastebuds on a trip through time! Prepare the rice according to package instructions, but substitute vegetable broth for water and season it with salt. While the rice cooks, prepare the filling. Preheat oven to 375 degrees and lightly oil a 9x13” casserole dish with cooking spray. Melt the vegan margarine in a large pot over medium heat. Stir in the flour with a wire whisk until smooth and cook for 1 minute. Slowly pour in the mushroom broth while continuing to whisk until no lumps remain. Whisk in the soy milk a little at a time. Continue to cook for 5 minutes, whisking constantly, until the mixture has thickened. Stir in the nutritional yeast, spices, salt and pepper. Remove from heat and set aside. Heat olive oil in a large pan over medium heat. Cook onion for 7 minutes or until translucent. Add mushrooms and cook for 5 minutes or until tender and brown around the edges. Add broccoli and cook for another 5 minutes. Mix seitan, rice and veggies in an extra large bowl. Stir in the cream sauce until well combined. Pour into casserole dish and top with Daiya (if using). 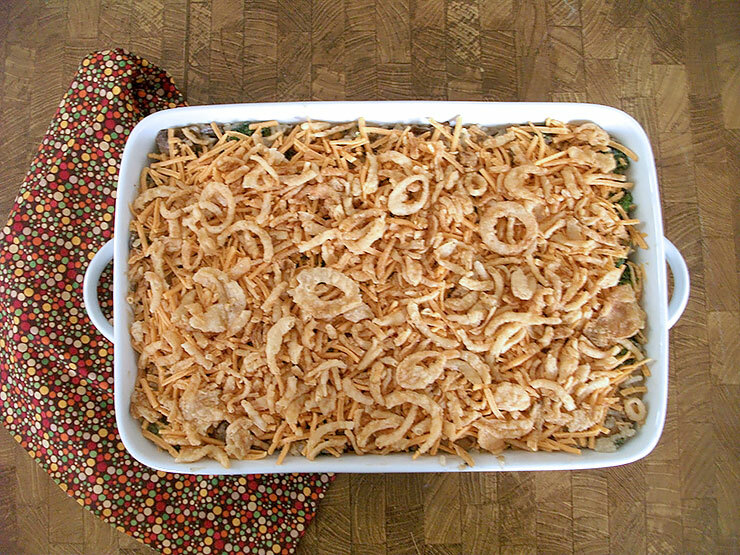 Sprinkle with French fried onions, crushed vegan crackers or vegan bread crumbs. Bake for 15-20 minutes. Let cool for 10 minutes, then serve.